I’ve had a rather action‐packed weekend, and one of the highlights was visiting the new Michaels craft store just 3 subway stops away from my house! :D And because they were having a grand‐opening sale, I thought it would be a great opportunity to buy a 16mm crochet hook — for $3! Aside from it being on sale, I also thought it would be good to buy it because I want to try making the felted bucket hat from my last post. And also learn to make broomstick lace, which requires the use of , well, a broomstick. But people also use large knitting needles. And I thought a large crochet hook would suffice. Last night I tried crocheting with it. 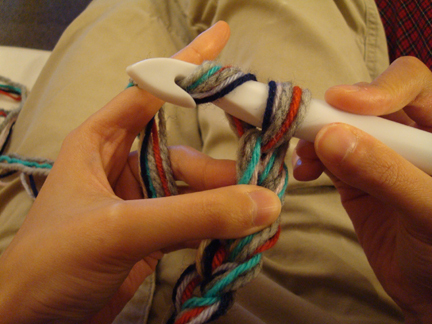 It takes a bit of getting use to, wielding such a thick crochet hook. I tried crocheting with 6 strands of yarn together. And it eventually turned into a neck warmer. 5–6 different balls of yarn. I used 2 balls of chunky, 3 balls of worsted, and 1 ball of DK. Row 1: I made a chain with all 6 strands of yarn held together until the chain is long enough to wrap around my neck loosely, then I made 4 more chains. Row 2: In back loop only, sc in 2nd ch from hook, sc in each ch across, ch 1, turn. Row 3–4: In back loop only, sc in each st across. Fasten off. Weave in ends. Sew on button on one end. The gaps between stitches act as button holes, so one can adjust how much the two ends overlap. It would be interesting to see it made wider and with different colour and texture combination too! I LOVE LOVE LOVE this neck warmer! What a great idea! 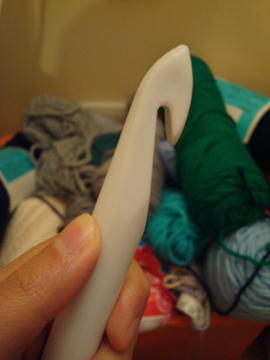 And now all I want is a giant, comical crochet hook! Do you have to use 6 strands of yarn? Thanks for visiting Shirley! You can use fewer strands and a smaller hook. If you use few strands with the same large hook, it won’t be as plushy. Happy crocheting! I have the same one from Michael’s! It’s the perfect size for t‐shirt yarn, and I used it to make a bathmat from an old cotton sheet. I bet this method would make a cute little purse too, and think of all the color combinations! a purse is a great idea! //escribitionist.wordpress.com/2011/02/10/neck-warmers/ :) Thought you would want to see them. Thanks for the idea and pattern. I love it! Sorry, I write in Thai in my blog. Your link is there in the post, but you don’t allow pingback/ trackback here? It is not easy to find chunky yarns here, so the yarns I used weren’t as thick as yours. I used 10mm hook I got from Daiso. Thank you for your message! It is so exciting to meet crafters in all different parts of the world. 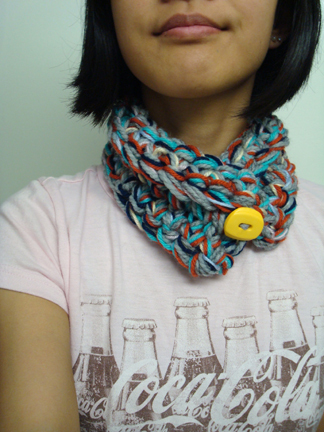 WordPress did send me a pingback that led me to your blog — the neck warmer you made is lovely! Love the colour combination of the yarn! I was also able to read it thanks to Google Translate :D I’m glad you enjoyed the pattern! OMG I love it… This is so cute… I have a Q hook that I bought a while back it will be perfect. I am all about 1/2 hour projects!! Can’t wait to try this project..